The aim of Tauris is to maintain a high standard of quality and safety for its products, thereby also increasing the trust of business partners and consumers. The introduction of a quality management system ensures that the company has a stable quality of the final product throughout the whole process, up to its final form, expedition and sales. Food safety is monitored by HACCP, which is implemented in all premises. 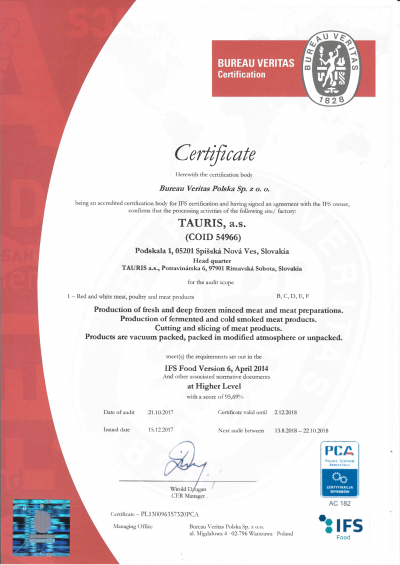 The production of meat products in the Slovak company TAURIS has been subject to a strict HACCP (Hazard Analysis and Critical Control Point) system since 1997. A free translation of this term refers to a system based on preventive measures in the production of food. This ensures health food harmlessness. Procedures based on HACCP Tauris Inc. has fully complied with the date of approval on 31 March 2004. Subsidiary Slovak company TAURIS Nitria Ltd. has been working in HACCP system since 1995. The aim of the Slovak company TAURIS is to adhere to a high standard of quality and safety of its products, thereby also increasing the trust of business partners and consumers. Food safety is monitored by HACCP, which is implemented in all premises.